Do you have your current car, truck or SUV paid off? Are you pretty close? If either of these is the case for you, you could very well be sitting on a valuable piece of the pre-owned automotive marketplace. Normally, the idea of getting a different vehicle doesn’t even register in a person’s mind until they’ve reached the end of a lease or have had the vehicle for more than a few years after it has been paid off. However, the Vehicle Upgrade Program at Yokem Toyota is changing the way people find their next vehicle from the Shreveport, Louisiana dealership. Our customers that have taken advantage of the Vehicle Upgrade Program at Yokem Toyota has loved it. The overall message in each of the customer testimonials we have received have been pretty much the same: People had no idea what was capable of being worked out when the took full advantage of the system in place. Too many people thought they were stuck in the vehicle they are driving right now and wouldn’t be able to find a better deal. 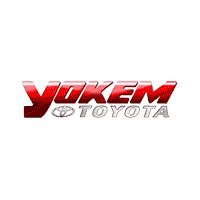 Lauren Lajas, a long time customer of Yokem Toyota had the type of experience we are trying to find for each of our customers that use the Vehicle Upgrade Program. Remember, when or if you decide to take advantage of the Vehicle Upgrade Program at Yokem Toyota is totally up to you. Yokem Toyota doesn’t use high pressure sales tactics to force your hand. Each time you visit our service department, you can probably expect to see one of our upgrade program professionals. You may tell us you’re not interested nine times in a row, but on the 10th time you hear our pitch, we could be sitting on the perfect vehicle just waiting for you to take home. There are any number of reasons you may want to take advantage of the Vehicle Upgrade Program at Yokem Toyota. Perhaps you weren’t really as in love with the vehicle you took home and wished you had found the one with the feature or features you truly wanted or maybe you have had a recent addition to the family and need a larger vehicle, you will certainly have several options of how to proceed.